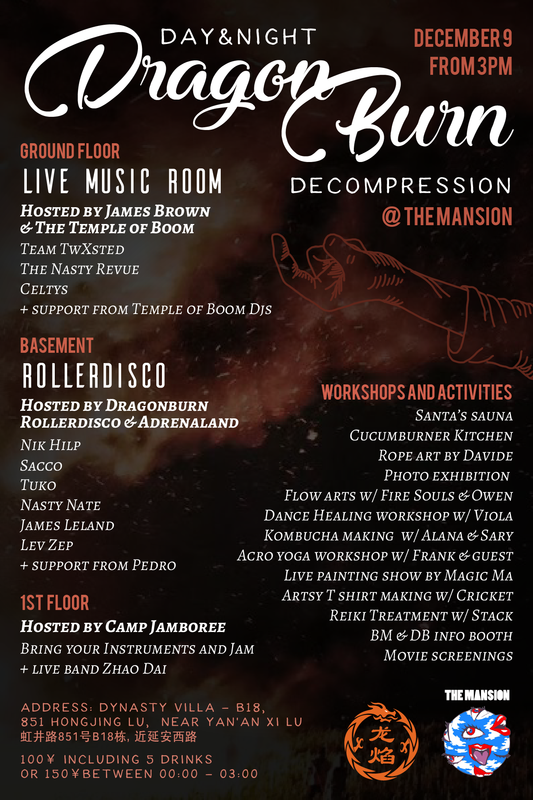 It’s Decompression: a special daytime to nighttime annual event that brings all the elements you would expect at a Burn to a fabulous venue. We’re glad to be hosting it this year at the newly spruced up Mansion. We have a full roster of workshops, installations and activities. Full details further down, ladies and gents.All of the theme camps will be representin’… Dragon Burn Rollerdisco and Adrenaland will be joining forces and taking over the basement roller disco madness with late night DJs, hustling and bumping. James Brown & The Temple of Boom hosts the ground floor room with their own special take on live music and DJs. Camp Jamboree will host the upstairs room, transforming it into an intimate Jam-space. 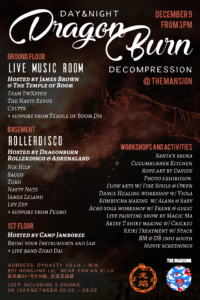 A decompression is a local reunion for Burning Man participants to help ease themselves back into everyday society after the “big event”. It is not uncommon for Burning Man participants to experience “post-Burn blues”, and decompression events can help alleviate the feelings of loneliness and separation that can occur. The events provide an opportunity to participants to share feelings, art, performances and memories. As awareness of Burning Man has spread around the world, decompression events have evolved to welcome newcomers to Burner culture. Dust off your Burner gear and get ready for the big decomp rendezvous! PS: Wanna warm up before getting your Burn on? Some of the Adrenaland folks will be doing a skate route from downtown to Mansion. Meeting Time: 2pm / About 2h cool ride through the cityLocation: From DowntownIf you’re interested pls contact (Wechat ID): yarma22 OR gavrocheenchine.